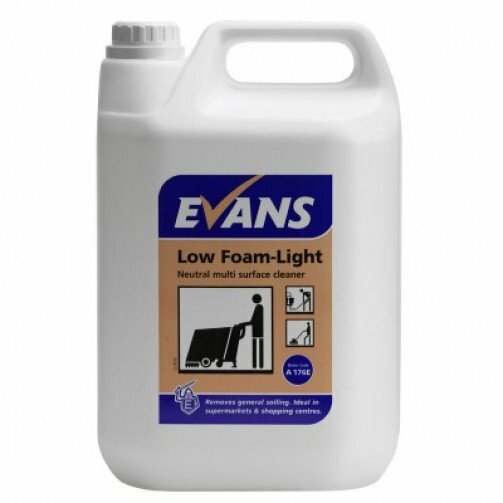 Evans Low Foam Light is a multi surface, low foaming neutral cleaner. It is designed for use in a combination scrubber dryer floor machine. Evans Low Foam Light is ideal for cleaning a wide variety of floor surfaces including vinyl, rubber, ceramic, terrazzo, marble, sealed wood and cork and all polished floors. Evans Low Foam Light contains a blend of nonionic surfactants, stabiliser, sequestering agents, preservative and dye. For use on a variety of hard floor surfaces. Removes light to general soiling with one pass of the machine. Unperfumed, suitable wherever food or drink is prepared or served. A. Yes this product is concentrated and you can put it straight into your scrubber dryer, no dilution needed, and it is also a low foaming product.